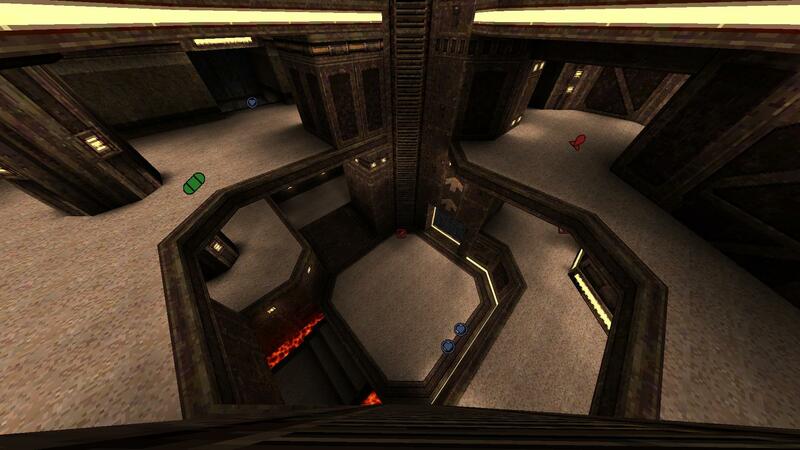 A couple more one-map tournaments in the next few weeks, starting off with one of foogs's maps, shifter. The tournament structure will be small double-elimination brackets, and will start an hour later than recent Sunday events - hopefully this gives more people a chance to enter. Expect the games to be complete by 11:30 CEST. I'll do my best to split people into divisions to try and make sure the games are close. Update: Tournament is complete, thanks to everyone who played. We had a couple of last minute drop-outs in div2, where Thor managed a 100% record en route to the title. Div1 was won by rio, who battled through the loser's bracket to beat VVD in the final. Sign me up. I'm gonna try and play through the pain. Thanks Foogs for the map. We have to do something with LG and/or with LG room… Don't need 2nd dm6 with "deny LG all 10 mins" strategy. You can camping LG from middle room and spam it from all floors. IMHO, we have to add a 2nd LG at cells near mega. The map is really big. It's bigger than: aerowalk, bravado, ztndm3, dm4, dm6 and q1q3monsoon too. Look like same size as dm2, but shifter is more open - easier to find opponent and harder to hide. I think it's good replacement for dm2 (same as q1q3monsoon is good replacement for dm6)! P.S. Signups for Thunderdome 9 are open, but map pool is not decided yet. Definitely: aerowalk, bravado, ztndm3 and dm4 + 1 or all 3 maps from a list: q1q3monsoon, shifter and dm2. Despite everyone talking about the size of the map, average of div1 games was 31.6 frags... whether that stands up once everyone gets the hang of it or not is the question, but even the close games were generally 20+. - the lack of sound queues, sometimes the map goes very silent. - make the RA teleport bi-directional? Shifter seems nice, I wanna try it out more.